They say you don't know where you're going until you know where you've been. Well, we have a rich 140 year history, and we're proud to share it with you. It all started with one Fire Policy. Few insurance companies will insure risks in the new frontier, so neighbors banded together to mutually insure each other's property against fire and windstorms. Their promises help form the foundation for what is now Columbia Insurance Group. The Boone County Home Mutual Insurance Company is created in Columbia, Missouri in 1874. The Board of Directors is made up of John Samuel, J.S. Dorsey, William Switzler, John Harris, William Woods, John Hubbell, George Trimble, T.B. Gentry and R.L. Todd. Home Mutual Insurance Company takes over the assets and liabilities of Boone County Home Mutual Insurance Company in 1938. Rock Port, MO office circa 1889. H.F. Stapel forms and is secretary of Missouri Farmers Mutual Tornado, Cyclone and Windstorm Insurance Company headquartered in Rock Port, Missouri. The name was changed in 1934 to Farmers Mutual Windstorm Insurance Company, and in 1969 the name was changed to Columbia Mutual Insurance Company. For years the leader of a mutual company was given the title of secretary, and was the day-to-day operations manager of the company. The president's duty was merely to preside over the annual board meetings. Farmers Mutual Hail Insurance Company plaque. H.F. Stapel forms the Farmers Mutual Hail Insurance Company of Missouri to fill a need for crop insurance. H.F. Stapel (founder) dies, and his son, John, is named our company's second secretary at the age of 25. At the time, we had $12.4 million of insurance in force. Paul Rutledge, named secretary, is hired to run Farmers Mutual Hail Insurance Company, and his father, W.A. Rutledge, is placed on the Board. W.A. Rutledge founded The Farmers Mutual Hail Insurance Association of Iowa and was instrumental in forming the National Association of Mutual Insurance Companies with H.F. Stapel before his death. Downtown Columbia, Missouri's Hitt Street. Farmers Mutual Windstorm Insurance Company and Farmers Mutual Hail Insurance Company of Missouri move from Rock Port to Columbia, Missouri in 1930, providing a more strategic location for our continued growth and expansion. The companies have six employees total. Five years later, we will move from our initial Ninth Street location to Hitt Street. Gasoline rationing occured during this time. Due to the war, tire and gas rationing hamper our ability to adjust losses. We comply with the government's wage and salary freezes. We also comply with the United States Department of War when asked to become a fiduciary agent of the War Damages Corporation for writing insurance of war damage risk. Enlistments of our personnel into the military require additional hours to be added to employee work schedules. We move to a new, larger headquarters on the Business Loop 70 in Columbia, Missouri. John Stapel retires, and Frank Blakemore becomes secretary of Farmers Mutual Windstorm Insurance Company. Darrell Seltsam is named secretary of Farmers Mutual Hail Insurance Company. Farmers Mutual Windstorm Insurance Company had $314,000,000 of insurance in force and a surplus of $1,257,000. We celebrate 75 years in business with a "Diamond Jubilee", and begin offering premium gifts to agents who write two new applications or combined policies of $4,000 or more. John Stapel comes out of retirement to become secretary of Farmers Mutual Windstorm Insurance Company after Frank Blakemore suddenly dies. Les Keuck is hired as our company manager. Missouri Farmers Mutual Hail Insurance Company Incorporated, which began business in 1940, changes its name to Midland Mutual Insurance Company. Columbia Mutual Insurance Company posts $1 million in surplus. Darrell Seltsam replaces Les Keuck as secretary and John Stapel is elected president of Farmers Mutual Hail Insurance Company of Missouri. Direct written premium rises to $1.5 million with a surplus of $2.1 million. Insurance in force is more than $611 million. This year, the term "secretary" was discontinued in favor of the term "president," and the terms "president" and "chief executive officer" became standard parlance for our leaders. The board leader was designated as "Chairman of the Board." Our Columbia companies move to a new headquarters at 2102 White Gate Drive in Columbia, Missouri to accommodate growth. This building was formerly a shopping mall, including about 67,000-square-feet and two levels of space. The company occupied a small portion, and leased the remaining space to additional tenants. The 107-year-old Home Mutual Insurance Company is merged into Columbia Mutual Insurance Company. Midland Mutual Insurance Company also becomes part of Columbia Mutual Insurance Company. Citizens Mutual Insurance Company joins Columbia Insurance Group next year. Company's policyholder surplus stands at $5 million, and the company begins to write auto insurance. Arlo McNary becomes the company's sixth president of Columbia Insurance Group. The company begins writing in Arkansas as well as writing commercial lines. Our Omaha Branch is established after this acquisition. Acquired National American Insurance Company of Nebraska and entered the Nebraska market. The company changed the name to Columbia National Insurance Company and established our Omaha Branch office this year. Columbia Insurance Group celebrates a 100 year history with new logo. This year marks the 100th year of operation. A new company name, Columbia Insurance Group, and logo are created in honor of this momentous date. The symbol within our logo is unique among insurance companies. It is a graphic presentation of a person holding the American flag, which represents Everyman and Everywoman. Our symbol represents "our company heritage - an organization born 100 years ago in the heartland of our nation; dedicated to protecting its citizens as they go about realizing the American dream." ~ Arlo McNary, president Columbia Mutual Insurance Company and Midland Farmers Mutual Insurance Company merge into Columbia Mutual Casualty Insurance Company. The surviving carrier of these and other mergers is named Columbia Mutual Insurance Company, and it is licensed to write policies in 22 states. This is also the year we begin to offer an agent cooperative advertising program. Great Plains, Swedish American and Patrons become affiliated with us. We issue our first Property/Casualty policy in Georgia and Iowa. We acquire Patrons and Swedish American Mutual Insurance Companies. Great Plains Mutual Insurance Company becomes affiliated with Columbia Mutual Insurance Company through an operating contract. A Kansas branch office is established in Olathe, Kansas; however, it is moved to Salina - its current location - next year. Bob Wagner is named the seventh president and CEO of Columbia Insurance Group. We have 150,000 policyholders, more than 160 local employees and a total of 290 employees in 10 states. Pinnacle Agents are our top tier partners. We introduce the Pinnacle Agency Program, offering additional benefits to reward those "elite agencies that demonstrate a commitment of sustained profitable growth with our companies." Policyholder surplus reaches $145.5 million. Direct written premium stands at $204.6 million and commercial direct written premium sets a new record at $129 million. We are named to Ward Group's Top 50 Property/Casualty Insurance Companies in the United States. We're also named "Company of the Year" by the Independent Insurance Agents of Arkansas. Our market territory in 2006. The Celent company names Columbia Insurance Group as a "Model Carrier" for the company's contractors' businessowners rating and policy issuance automation system. Celent is a research and consulting firm focused on the application of information technology. The company is ranked in the Top 50 of all Property/Casualty insurance companies and in the Top 30 of commercial lines writers by National Underwriters. 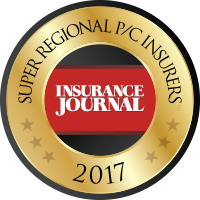 We are named a "Super Regional" company by Demotech, Inc., an actuarial consulting and financial analysis firm. We acquire Association Casualty Insurance Company and Georgia Casualty & Surety Company. Additionally, the company begins selling Property/Casualty policies in Alabama, Florida, Kentucky, Louisiana, Mississippi, North Carolina, South Carolina and Texas. Columbia staff recognized by MAIA. Policyholder surplus reaches $167 million. Direct written premium stands at $248 million. Commercial direct written premium stands at $165 million. We are licensed for personal and commercial lines Property/Casualty products in 30 states and writes business in 19 states. We receive the Missouri Association of Insurance Agents "Top Partner of the Year" honor, as well as the "Company of the Year" award from the Independent Insurance Agents of Nebraska. Columbia officers pictured for "Company Of The Year" recognition. We are named one of the Top Five Best Places to work in mid-Missouri by Inside Columbia magazine. Named "Company of the Year" by the Arkansas PIA, and also designated Regional Insurance Company of the Year by Independent Insurance Agents of Arkansas. Bob Wagner retires as CEO after 41 years with the company. Gary Thompson becomes the company's eighth President/CEO. We are designated as a "Super Regional" Company by Demotech, Inc. as it has been since 2006. Columbia Insurance Group proudly moves forward, building upon the strong foundation of our history. The five entities that comprise our family of companies are Association Casualty Insurance Company, Citizens Mutual Insurance Company, Columbia Mutual Insurance Company, Columbia National Insurance Company, and Georgia Casualty & Surety Company.